Today I received something really exciting from the post office. 3 rods from Arctic silver! A 9″ 5wt Trout, a 9″ 6wt Coast and a 9″ 8wt Bonefish rod. At first glance they look and feel different from traditional fly rods, mostly due to the new innovative design of the handle. The handle sits comfortable in my hand and the non slip coating feels great and gives you a firm grip. 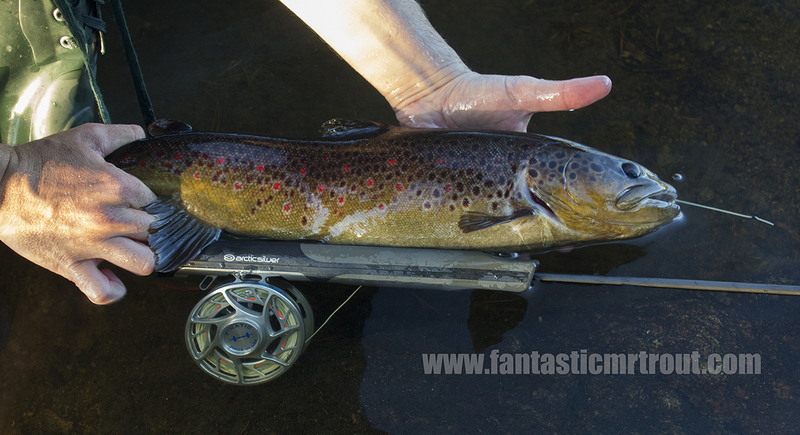 The grip itself is as long as a traditional Cork handle on any other 5 wt rod. Below the grip is the quick lock reel seat, I found that to be a great idea, snaps the reel in place within seconds. Seeing a had a few new rods to try out I headed on up to a local lake to fish for rising wild brown trout. After having spent an evening casting the 5wt and a 6wt, I have to say I am impressed. Having only cast a few hours with them, my first impressions are that the 5wt is a pure presentation trout rod. This one is for delicate presentation fishing, the leader just rolled out time after time even when I kind of screwed up the cast. The rod comes with two tips, I only got time to try out the “fast” action tip. The 6wt Coast rod, was a faster one, right up my alley. This one will own the sea run trout this summer. I truly enjoyed casting this one, however I didn’t get the chance to try it out as much as had hoped. Trout were rising everywhere and I my 5wt Trout rod was rigged for success so couldn’t ignore them any longer. Obviously I will stress the rods hard over the following weeks and I will get back to you with more details on how they are holding up.